1. I got new glasses. For free! I saw an ad on Facebook for a free pair of glasses from Coastal.com (just pay shipping), and so I did. And I love them! A little bigger and nerdier than I'm used to, but that's the look right now, right? I hope? 2. I'm in a creative slump these days when it comes to blogging and Etsy. Something about being a mom to a newborn and going back to work takes so much energy that there's not much left at the end of the day. I've designed some new fabric for spring, though, and I'm hoping that it'll put a little spring in my creative step. 3. I'm back at the hospital, working just a couple days a week. It's plenty for now, and like I imagined, very bittersweet. Love caring for patients again. Hate being away from my boy. Love feeling challenged and having adult conversation. Hate having to find a place and time to pump every few hours. Such is the life of a working mom. 4. I'm treating myself to a beginner's upholstery class in February. I'm ridiculously excited about it. 5. Speaking of classes, I'm hoping to offer a sewing class sometime in late February or early March and am wondering... what would you like to sew? I've heard from some of you that you'd prefer a beginner beginner class, like how to thread your machine and sew a straight line? Or would you rather do a project like a bag or a pillow? Let me know and I'll get the ball rolling! I would soooo love to learn how to make the market ruffle tote that I have seen on your blog before. It is so pretty and I would be so excited to learn how to make one!! Oh and I am pretty sure I've seen a very pretty ruffle pillow on your blog as well, so that would be fun too! Good idea! I may plan on doing the ruffle pillow as a tutorial on the blog. Oh my goodness! What a little man! Love his facial expressions. Over-the-top cute! Also loved hearing what you are up to. I would totally be all over a beginner beginner (can I add beginner 5 more times?) class. I have a beautiful Bernina that was gifted to me but not a clue how to thread a machine, sew with a machine, etc. I'd love to learn though! One more thing...super fun glasses!!! Whitney...u r a superwoman..u inspire me so much. Love ur glasses n love ur little boy. SO far from superwoman but thanks for all your encouragement! Love the glasses! What a fun style. Did they get to you quickly? Yes... about a week or so! 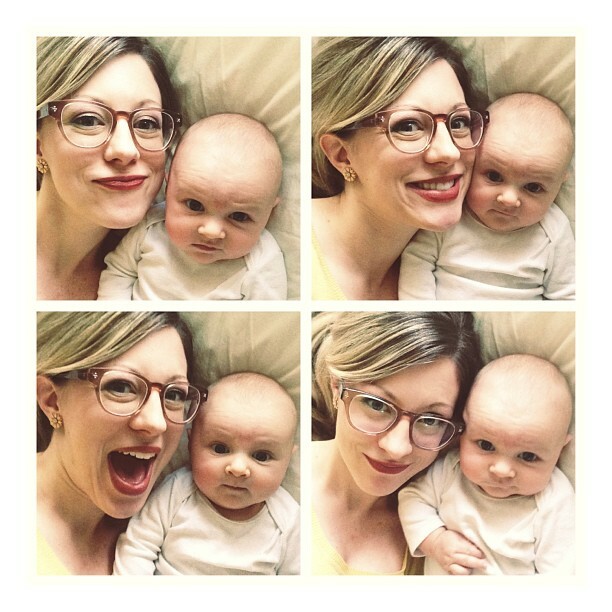 Cute glasses and even cuter little baby!! You're killing me. KILLING ME! I would so love to come to Cape Town. In fact, I have a dear South African friend who lives there (all the more reason, right?!). I will totally let you know WHEN it happens someday. Seriously. Love the glasses! I wish I could pull off that look, but I got a lot of NOOOO's when I tried. Oh well. I'm with you on the working mom life, although I went back a lot later. It's rough! But you get into the groove of things and it becomes normal life eventually. And the sewing: I'd love a reeeeeal beginners class. I know how to thread the machine but the sewing a straight line was a flop. Kind of sad. Ah! Just realized you meant an in-person class. Don't mind me, working mom here. Apparently the brain doesn't ever get back to normal. Haha I'm right there with you. :) And I may do an online tutorial for something soon. Love the idea of a sewing class! Any way you'd be able to make a video of it so those of us not in your area can see too? Thanks!! Possibly! Or at least a tutorial with tons of photos. I've worn contacts since 6th grade (and glasses only at night), but trying to change that. And I'm thinking I may do 2 classes (one for beginner beginner and one for anyone who can sew a straight line) so I'll keep you posted. You are super cute in those glasses not to mention your super cute sidekick:) Wish we lived in TN but alas, we're in the frozen tundra! The frozen tundra... I used to live near there! Whitney I really admire you, your blog, your creativity, and your faith! You go girl. I am also a seamstress and was wondering about the process you go through to design your own fabric. Can you tell me more about that?